The following is an excerpt from The Promise of Apprenticeships in New York. Apprenticeships are gaining ground in the United States. Built to align the skills of workers with the needs of employers, the apprenticeship model is a powerful tool for economic mobility—opening career paths to people with limited education by allowing them to earn a salary and learn a profession at the same time. In the U.S., research indicates that registered apprentices out-earn their peers by more than $300,000 over the course of their careers.1 And apprenticeships are a valuable model for growing industries like healthcare, finance, and tech with a significant number of middle-skills jobs. But while President Trump has embraced apprenticeships in recent years and states from Colorado to South Carolina have implemented ambitious initiatives to expand this high-impact career pathway model, apprenticeships are still a relatively untapped opportunity in New York. There have been promising steps in the right direction during the past year. Governor Cuomo recently announced a new state investment to create pre-apprenticeship and registered apprenticeship positions in advanced manufacturing and healthcare over the next four to six years. Meanwhile, in New York City, Mayor de Blasio launched ApprenticeNYC, which aims to establish 450 apprenticeships in the industrial, health, and tech industries over the next three years. But New York has a significant opportunity to go further down this path. New York has just under 17,000 apprenticeships, a surprisingly small number for a state with a labor force of 9.6 million. Though the third most populous state, New York ranks seventh in the number of registered apprenticeships, 12th in the number of apprentice programs, and 45th in the rate of growth in apprenticeships since 2011. In New York City, apprenticeships appear to be even rarer. Although the city accounts for 48 percent of the private sector jobs in the state and 43 percent of the state’s population, only 11.9 percent of the registered apprenticeship programs statewide are in the five boroughs. Meanwhile, only a handful of apprenticeship programs exist in the city’s fast-growing fields like the tech sector, healthcare, hospitality, and the finance industries—serving a few dozen employees annually at most. Expanding apprenticeships should be a priority for New York City and State, with clear benefits for workers and employers. At a time when New York’s economy is booming but far too many New Yorkers remain stuck in low-wage jobs, apprenticeships provide one of the most reliable springboards into the middle class. They are a proven model for vaulting individuals from low- and moderate income backgrounds into well-paying jobs and giving them skills and credentials that set them up for long-term career success. Moreover, at a time when far too few New Yorkers from low-income backgrounds have managed to access well-paying jobs in growing industries like the tech sector, apprenticeships offer a model that works, helping individuals develop the skills and relationships they need to succeed. The model also provides employers with an effective way to diversify their workforces, while cultivating new employees who meet their specific hiring needs. As we detail in this report, there are a number of reasons why apprenticeships have been relatively slow to get off the ground in New York—from an overly cumbersome state process for registering new apprenticeship programs to a paucity of employers that have embraced this model, particularly outside of the building trades. But as several other states have shown in recent years, these hurdles can be overcome. This report details some of these best practices, and sets forth several achievable steps for state and local policymakers, business leaders, and workforce development practitioners to take to help New York City and State deliver on the significant promise of apprenticeships. This policy brief provides a detailed analysis of the opportunity to expand apprenticeship programs in New York City and State. Funded by Barclays, the report offers a new level of detail about the current landscape for apprenticeship programs in New York and outlines both the opportunities and challenges to expanding the model. Based on an extensive data analysis and interviews with more than 30 apprenticeship experts in New York and around the nation, the study also shines a light on some of the most promising apprenticeship initiatives in the U.S. and outlines several achievable recommendations for boosting apprenticeships in the city and state. Expanding the apprenticeship model has become a rare issue with bipartisan support. 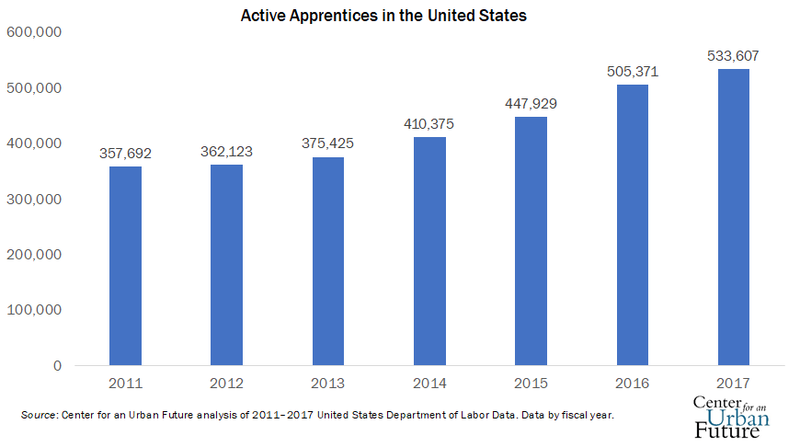 With backing from the Obama administration, including federal grants for state apprenticeship initiatives, the number of apprentices nationally surpassed 505,000 in 2016 from 375,000 in 2013. In 2017, it hit 533,607. An executive order signed by President Trump last June doubled federal funding for apprenticeship programs to almost $200 million per year, while setting a goal to bring the number of apprentices in the U.S. to five million. More recently, a Trump administration task force on apprenticeship published a report with its own recommendations to expand apprenticeship programs, including pushing for industry-recognized alternatives to registered models. In America, where apprenticeships have mostly been confined to the building trades—unlike Europe, where apprenticeships span most major industries—apprenticeship programs are now emerging in fields like healthcare, cybersecurity, hospitality, and the creative industries. Employers that have started apprenticeship programs or apprenticeship-like models in the U.S. include giants like Accenture, JPMorgan Chase, Amazon, Barclays, and CVS. 1. Debbie Reed et al., “An Effectiveness Assessment and Cost-Benefit Analysis of Registered Apprenticeship in 10 States,” Mathematica Policy Research, July 25, 2012, https://www.mathematica-mpr.com/our-publications-and-findings/publications/an-effectiveness-assessment-and-costbenefit-analysis-of-registered-apprenticeship-in-10-states. Graduates of registered apprenticeship programs earn an estimated $301,533 more than their peers over their careers, including wages and benefits.